You might have heard economists talking about an “improving financial landscape.” While that’s technically true, the fact is that a lot of us are still struggling. Bills are due every month, and sometimes it feels like the debt just keeps mounting. Thankfully, there are options to get back on your feet. These days, more people are discovering auto pawn (also known as vehicle title loan) as an excellent source of quick cash. Learn why this option could be your best bet to avoid foreclosure, bankruptcy, or any other money woes. As a responsible vehicle owner, you take pride in keeping your car, truck, or motorcycle in top shape. For you, driving around in the pleasant Volusia County sunshine is a privilege you look forward to each day. Now, that care and attention-to-detail can work in your financial favor. When you bring in your vehicle in good working order with a clean title in your name, you could be on your way with cash in hand before you know it. That’s because title loans are based solely on the value of your vehicle. At Auto Pawn, we don’t pry into your credit, debt, financial history, or any other private information. Plus, did you know that your unwanted gift cards are another way to get the funds you need? We buy all kinds of gift cards, including those from Walmart. 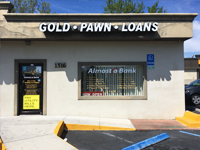 In addition, we offer the most cash for gold in Deltona, Florida and the surrounding region. That’s one more way Auto Pawn stands out from the pack. Creating and sticking to a budget is a time and labor-intensive process. Plus, life rarely goes exactly according to plan. There will always be unexpected expenses, necessary repairs, medical bills, and other financial obligations that throw a wrench into your long-term strategy. That’s where Auto Pawn comes in handy. We deal in all types of vehicles, both foreign and domestic. From cars and trucks, to motorcycles, RVs, and boats, we’ve seen and made loans on a wide variety of automobiles. That’s partly how we’ve gained a solid reputation as one of the best pawn shops in Daytona Beach. Filing for bankruptcy or suffering a foreclosure can also have long-lasting effects on many different aspects of your life. Along with the financial impact, some employers might be turned off if they see such entries on your credit. Auto Pawn is a safe and legal method to quickly get the cash you need without having to resort to drastic options. Even if you’re not facing such scenarios and just need a reliable source of fast income, it’s nice to know that there are other choices than having to put up with the big banks and their restrictive terms. 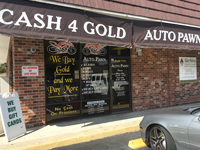 As you’re investigating the best Orange City pawn shop, why not stop into Auto Pawn? Just bring in your vehicle in good working order with a clean title in your name, and our friendly and knowledgeable team members will get started generating a personalized offer for you. As mentioned, vehicle title loans are a 100% legitimate method to secure the funds you need. Plus, in most cases you’ll have a decision and offer in no time. Whether you’re trying to avoid foreclosure, bankruptcy, or just seeking a source of reliable income from a reputable and well-known company, we’ve got you covered. The first step is to bring your vehicle to any of our three Volusia County locations. You’re also welcome to call us anytime. Our skilled team members are always glad to answer your questions. 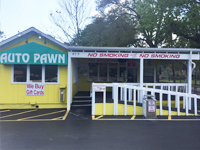 Through fair deals and generous terms, we’ve built a solid reputation as a premier DeLand pawn shop. Don’t sit in some stuffy bank waiting for a cookie-cutter response. Receive the respect and fair treatment you deserve at Auto Pawn. Visit or contact us today to get started.